After staving off elimination twice last weekend en route to the Hockey East Championship, the #13 Terriers will seek to further extend their season, taking on #4/3 Cornell in the NCAA Northeast Regional at the DCU Center in Worcester, Massachusetts. Puck drop is at 1 p.m. for the contest that will air on ESPNews and will be live streamed on WatchESPN and TSN Go. Today’s game will be the 47th between the teams (Cornell leads 24-19-3) but just the third in NCAA tournament play. The Big Red beat BU, 4-1, in the 1967 national title game; five years later, the Terriers blanked Cornell, 4-0, for its second straight championship. In last November’s Red Hot Hockey game at Madison Square Garden, BU rallied from a 4-1 deficit but could get no closer than 4-3. BU, currently unbeaten in its last seven games (6-0-1) will face the challenge of denting Cornell’s best-in-the-nation defense that has allowed only 1.53 goals per game. It’s freshman goalie, Matthew Galajda has the top GAA (1.49) and third best save percentage (.940), earning himself a spot as a Hobey Baker top-10 finalist. Anthony Angello leads a balanced attack with 26 points and 13 goals. For BU, junior Jordan Greenway is playing the best hockey of his college career and is tied with Bobo Carpenter atop the Terrier scoring list with 33 points. Freshman Shane Bowers has 31 points. Drew Melanson led BU in goals during the four-game Hockey East playoffs with four. Goalie Jake Oettinger, who earned MVP honors for his 1.85 GAA in the Hockey East tournament, posted a .958 save percentage during BU’s current unbeaten streak. Yesterday, Coach David Quinn, captain Brandon Hickey, Bobo Carpenter and Drew Melanson met with the media. Former BU All-American and Most Outstanding Player of the 2009 NCAAs Colby Cohen guested on The Pipeline Show (audio), discussing the NCAA tournament. He is doing game analysis for ESPN at the Midwest Regional in Allentown, Pennsylvania. 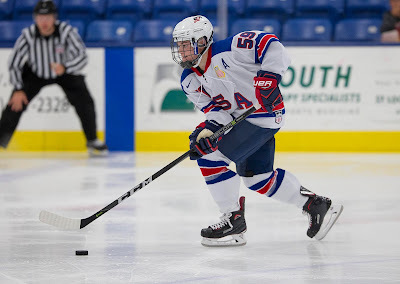 2018 recruit Joel Farabee scored an extra attacker goal, assisted by fellow recruit Jake Wise, that pulled the U18s even with Chicago and Team USA went on to a 5-4 overtime victory. Farabee has 27 goals and 62 points. 2019 recruit Robert Mastrosimone had an assist for the Steel and is the fourth leading scorer among USHL rookies. 2018 recruit Hugo Blixt (photo) assisted on a power play goal as Tri-City edged Sioux Falls, 1-0. The 6'4" defenseman from Sweden has 25 points in 51 games. 2019 recruit Trevor Zegras (photo) scored his 16th goal and assisted on two others in the NTDP U17s’ 9-3 win against Central Illinois. Zegras has 47 points in 41 games. Alex Vlasic scored his seventh goal for the U17s. Vlasic, a 6-5 defenseman, has 25 points in 46 games.